I’m very happy to report that 2 much-needed and related features I’d filed bugs for at KDE’s Bug Tracking System bugzilla were added to KDE 4.2‘s KRDC. KDE 4.2 was just released and is now available within kdemod (aka Chakra)’s repositories. KDE-loving *nix-loving Windows administrators rejoice! Ability to specify a default Username: Previously, before logging in, you’d be prompted for the username. Now the prompt is automatically filled in with a default username. 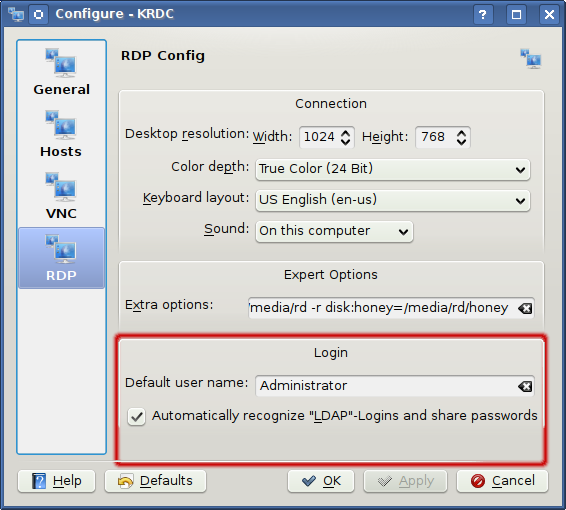 Ability to recognise LDAP logins and remember the password using kwallet as an LDAP Login. A very big thank you to the developer maintaining KRDC, Urs Wolfer. Koji distro koristite? i zašto? Očigledno, what operating system you use can say a lot about you. If you’re using some form of *nix, which distro you’re using can say a lot as well. Redundancy aside, I believe that a Linux distribution depends absolutely on its package management and distribution system. I liked apt-get (1, 2) but there was some technical problem at some point and it caused me to use aptitude instead. Using aptitude is slightly easier – it has more features automated into single, logical, commands where apt-get requires separate commands. Aptitude also has a curses-based GUI. If you’re not using the GUI then, other than brevity in terms of number of commands to learn, there is apparently no technical reason to prefer one over the other. Aptitude and apt-get serve K/X/Ubuntu i Debian dobro. From this point, I use the names Kubuntu and Ubuntu in a loosely interchangeable fashion. These 2 distributions are also within a class of distributions known as “binary” ili “binary-based” distributions. This means that when you download an update, the files that are downloaded are precompiled and should run on any “supported” hardware. This isn’t specifically optimised for your desktop’s hardware, na primjer, your processor. Perhaps you have an AMD processor which has extra instruction support which Intel CPUs do not have. The reverse could also be true. For this reason, a binary-release distribution cannot optimise for one particular brand of hardware. Regardless of this “non-optimisation”, it should run at a decent pace. Oko 2 years ago I started using Kubuntu. After a few months of working with it, I started to learn more about its specifics. I’m not much of a fan of using GUI tools to update the system when, ultimately, its all happening on the command-line anyway. The GUI tools just hide the complexity I don’t mind seeing. I ended up making a tresnuti Skripta, update, which would run all the steps required to get aptitude to just go ahead and upgrade already, kthx?©, perhaps stopping along the way to back up my configuration, remount the NFS network share where we keep an on-site repository, back up the local cache of aptitude’s installed packages, do some folder-link shuffling to use a local copy if the network share couldn’t remount, sync between the local copy and the network share if the previous update had a network share issue, and update lists of packages in the repository. In general, it wouldn’t go ahead if there were any errors though, as you can tell, this script became a messy beast that went above and beyond the original requirements. It worked well for me. Until the day came to update between Kubuntu 6.10 za 7.04. I did this manually though, not with the script. The difference between this rolling release and the “other” distributions is rather staggering. Na primjer: If KDE 4.2 were to be released tomorrow, you’d probably have to wait less than 2 weeks for it to be available on Gentoo. Ubuntu users might have to wait till 9.04 – that’s a 4-month wait. Personally, I’m not willing to put in the 40 hours of effort to get my system working the way I want it to. My colleague had to reinstall recently for some obscure reason and it turns out he wasn’t willing to put in the 6 hours (he’s more experienced with Gentoo) of effort to get his system back to how it was running either. Umjesto, Arch Linux caught his eye. Arch Linux is a rolling-release (like Gentoo), binary-based (like Ubuntu) distribution. Its packages (dobro, the vast majority of them) don’t need much tinkering with their config files to get things working nicely either. Its the best of both worlds! You still need to know what you’re doing* but if you’ve come to this juncture, it shouldn’t be such a giant leap of faith. Arch Linux’s package manager, called pacčovjek, has built-in dependency and conflict handling. I use another package manager, jogurt (French for yoghurt), which has very quickly become popular with Arch users. Yaourt enhances the functionality of pacman by allowing you to download and install applications directly from the AUR, ili Arch korisnik repozitorij. This repository contains scripts that allow you to automatically download and install many applications that would otherwise be completely unsupported by Arch’s own core developers. It downloads and compiles the package into a chroot’d environment. It then packages the chroot’d environment into a pacman-compatible package tarball and uses pacman to deploy it into your system. Također, the AUR supports a voting system whereby popular packages get placed into the more official [community] repozitorij. Yaourt also supports an automated voting mechanism whereby, after installing a package via AUR, it asks if you want to vote for its inclusion in [community]. I estimate that the time taken for my Arch installation was about 90 minuta. I don’t recommend Archlinux for newbies though I do recommend it for any Linux user who’s gotten bored with other distros – and wants to get into the nitty gritty without having to install Linux From Scratch. Arch Linux has been getting pretty popular these days. Its currently at number 14 na Distrowatch. Lukav na Koji distro koristite? i zašto?